I'm not sure what you are trying to accomplish ! Sounds like you want to see if the jackpot is working properly. The jackpot is definitely not working properly. I almost bought a replacement jackpot because I thought I had pieces missing on mine. 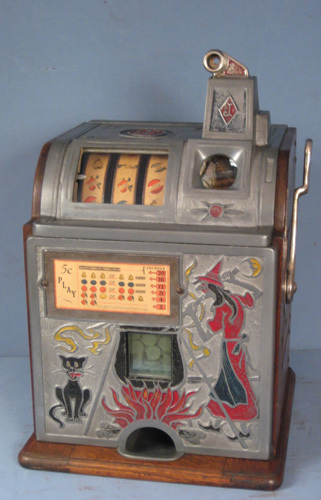 jackpot, which looks very similar to mine, I am hopeful that perhaps I can get my jackpot functioning again. Well , it s better with your news photos !! Now , we can say that all mechanism is complet ! No missing parts on Mech and jackpot, perfect !! The best way for help you , is that you need to know how your jackpot work! Since you have an hand load ,jackpot ,it s very simple !!! -For open it , you need to push up this part ! That s all , very simple !! Try this ,don t forget to put some coin in your jackpot ,and tell me if it work ! If no ,We will investigated on the jackpot , if yes ,we will took more attention on the mechanism ! Thank you for your thoughtful response, including the markup of photos with suggestions for what to do. when my son got 3 bell fruit and the jackpot did not empty / nothing occurred. I wondered, does my mechanism possibly have a setting that turns off the jackpot payout feature? moved a lever on the jackpot). I hope what I have written is clear. Now if you are sure about the first step on "how to fix a jackpot trouble" ,lets go to the second part ; the mechanism ! Put Something on the clock (like a cloth) for stop the fan . Put a coin in the escalator and pull the handle. At this time, the 3 reels will to rotate , and you can stop them in the 3 BAR position. Remove the cloth ,like this ,the mech can finish his cycle. If alway no jackpot ,don t touch anything ,just remove the mech from the wood case, and check the coin slide !! Send a photo of them !!! See you to the next chapter. I read the latest posts, seems Stephane has things in good order. He is very good. You should have the jackpot up and running fine in a short time. Good Luck !! I need a photos of the coin slide when you have set to three bell fruit, and released to complete the cycle, like this view ! I know , it s not the same like your coin slide , but if you keep the same angle for take the photo ,that will be perfect !! And for be sure about the jackpot , all the part see on my photo are the same than your jackpot !Exept all the parts in red over this line (not present on Hand load jackpot). And for be clear ! So Sorry , I can t make more clear since my English is really too at a low level !! and helped me test out your suggestions. It turns out my mechanism works fine. The jackpot door lever on the right hand side appears to be frozen /stuck. If that piece would move, all else might be in working order. If you can t remove the jackopt , use a little of WD40 on the frozen part, wait a little and try to move it . If this don t work , try again , , and if no way , no other solution to remove the complet jackpot . Your last set of photos are fantastic and provide the exact clarity I was seeking Thank you! Herb helped me to identify the tab in the second picture as well as the part in the third photo. is stuck, I have no way of knowing if this sluggishness will prevent the jackpot from tripping. I will keep you in the loop as i make further progress Thank you again for your support.